Te Amo! What Does Your Favorite Movie Say About You? I was saddened to learn about the death of actor John Mahoney today. 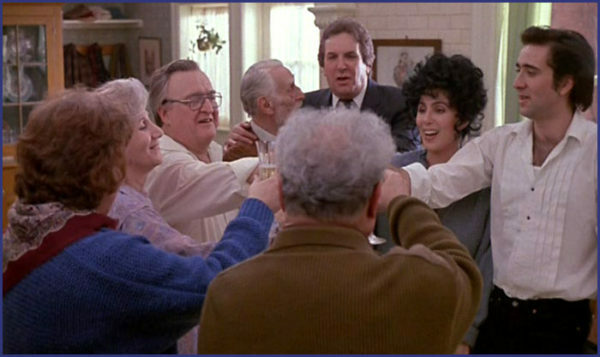 Most people remember him as the father on the hugely successful show "Frasier" but I always remembered him as Perry, the cad that Rose Castorini encounters after learning her husband Cosmo is cheating on her in the 1987 film "Moonstruck." Rose asks Perry, after watching him get a glass of water thrown in his face by a much younger woman, "Why do men chase women?" After Perry gives a speech flowery yet empty in nature, Rose deadpans to him "You're a little boy, and you like to be bad." 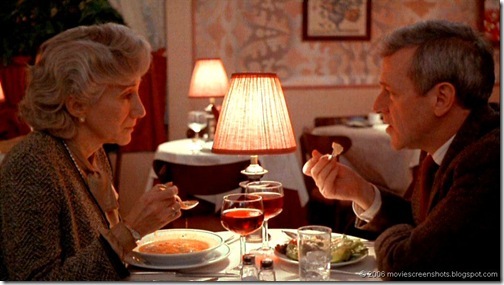 She isn't fooled by his romantic yet crafty ways, and the way Olympia Dukakis plays the scene, with tired yet whip smart glances and stares, reminds me over and over why "Moonstruck" is my favorite movie of all time. What does our favorite movie say about us? I'm talking about the one that touches you in new and exciting ways every time you watch it, the one that you can endlessly quote, the one you always seem to bring up in conversation. Sort of like what I did in the first paragraph of this piece. When people on Facebook were talking about John Mahoney, I kept commenting "Remember Moonstruck? He was wonderful in that..." and I'd ramble on about his brief yet compelling scene. We all have a movie like that, and thank goodness we do, because there is something about the art of film that speaks to our hearts like few other things do. Books, of course do, and music, but the idea of combining visuals with those words and notes and making something altogether unique might have something to do with our love of film as a society. When I watch "Moonstruck," I am transported to Brooklyn, into this Italian family, into their world, which is so different from anything in my life. I didn't grow up in a big Italian family, where life revolves around the kitchen table, where three generations or more of a family might live in the same stately brownstone that has been in the family for generations. I was entranced by this family, their passion for each other, for love, for food, for everything in their lives. When Loretta Castorini (Cher) is about to marry Johnny Camereri, her mother asks her "Do you love him?" When she says she doesn't, Rose replies "Good, when you love em, they drive you crazy, cause they know they can." Words like that, and the way Olympia Dukakis reads them, sound every time like she's saying them directly to me. Of course Cher as Loretta does fall in love in true operatic fashion with Johnny Camereri's brother Ronnie (a very young Nicolas Cage) and when Rose asks her again if she loves him, Loretta replies "Ma, I love him something awful." She knows the consequences of really falling in love, and she is ready to take that chance. That scene taught me so much about what grown-up love was really about: Knowing someone will drive you crazy cause they can, and going for it anyway. It's lessons like this one that make "Moonstruck" the movie of my heart, the one I always come back to when I feel like I'm falling out of touch with my own love for the world. It's a film that I don't just love, but am grateful for. So what about you? What is the movie of your heart? Let me know in the comments!